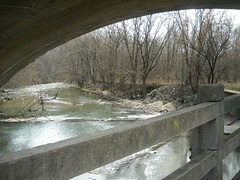 Herring Run is over 360 acres of linear, stream valley park located in North East Baltimore City. It was conceived as part of Olmsted's 1904 Greenway Plan for Baltimore. Herring Run is full of hidden rock features, great for bouldering, and has a wonderful trail that follows the river all the way to I-895. Herring Run Park is adjacent to Lake Montebello, so if you are out for a quick smooth ride or flat walk head to the lake if you are looking for a rolling, shaded trail with peeks of the river, head across Harford Road down to the Trail. Explore the nature trails, discover historic Hall Springs and buildings, fish from the bridge with its resident Great Blue Herons, or enjoy watching a game of Gaelic Football. Also has sports fields and picnic spots.